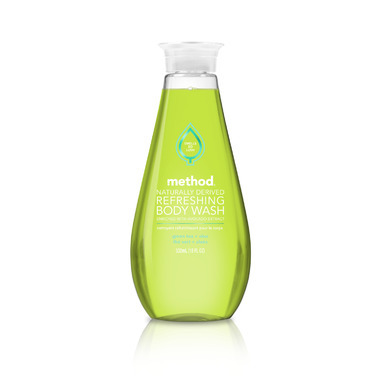 Method Refreshing Gel Body Wash is a naturally-derived formula that delivers a rich, luxurious lather. The enriched avocado and vitamin E biodegradable formula is free of dirty ingredients like parabens, phthlates, triclosan EDTA or animal by-products. The specially designed pull-top bottle for quick and easy dispensing is a 100% recyclable bottle made from recycled plastic (PCR) and never tested on animals. I like the scent and got familiar with it when using the liquid soap...to me I smell the "tea" scent more than anything, smells fresh ! Overall, a good product. This is a gentle body wash that has a nice lather. I love the bottle--great for use in shower--like a large dish detergent pull-up cap. I am just not a fan of this scent...it is fresh but reminds me of the 'aloe' fragrance typically found in low quality, cheap, synthetic formulas--not what I was expecting from Method.